This is simple to fix and deliciuos to taste large prawns dish, especially if you like the prawns to be packed with robust flavour with mild spiciness in it. Even though the prawns are to be served dry without any gravy, you may actually serve the dish with some cut limes, for squeezing its juice over the prawns upon tucking in, for more zesty flavour. Just to be reminded that with or without the lime, the prawns are juicy and moist enough to taste as it is pan-roasted (in Chinese, we called it 干燒 ‘Gan Shao’, which means dry-roast) where the prawns will be roasted and crisped on the shell, but tender and moist interiorly. Serve this prawn dish with pasta and baked potato as Western cuisine, or steamed rice as Chinese meal, this recipe makes your cooking a sure to impress! 1) Trim the prawns, cut a slit at its center back to devein, if desired. Otherwise, leave it as it is. Rinse and pat dry with kitchen towel. 2) Place prawns in a large shallow bowl, add the listed seasoning for prawns to marinate in the refrigerator for at least 30 minutes. Then, lightly flour the prawns with potato starch after taking out from the refrigerator when ready to cook. 3) Heat large skillet/ sauce pan with oil over high fire, sauté onion till lightly browned, and then add in garlic and chili paste (or chopped chili) to stir fry till fragrant. By now, the chopped onion should turns golden browned when garlic turns fragrant. 4) Reduce heat to medium-low fire. Melt butter, and add prawns (but do NOT stack the prawns) in the pan in single layer with some space around each prawn, and pan roast for 2 minutes till pinked on both sides. Add in light soy sauce (*beware of the sizzling effect when adding in light soy sauce), coarsely grounded black pepper and sugar. Further pan-roast on low fire for 2 – 3 minutes till lightly crisped on both sides. 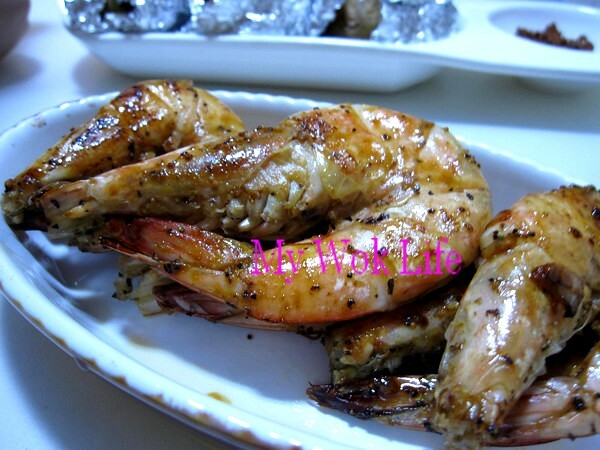 Flip the prawns constantly during the few minutes of pan-roasting process. 5) Then, increase heat to high fire, and quickly rizzle Chinese rice wine and cover pan with lid immediately, for 10 seconds, in order to seal the aroma. Heat off and remove lid from pan. Dish up and arrange nicely on serving dish. A serving of two large prawns with my recipe counts about 180kcal. Tips: Use dry sherry, if really can’t get any Chinese rice wine. * Omit the chili, for serving non-spicy diners and children. 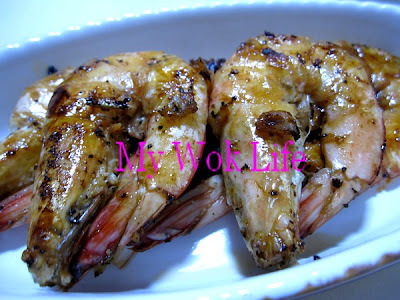 * Shell of the prawns has to be remained intact, for retaining its moist in its flesh on pan-roasting process. Hi! It is my first time here in your blog site. I couldn’t find rice wine you are recommending. Can I use ShaoXing rice wine instead? Hi! I tried both your Pan-Fried Tofu with Spring Onion and Chinese Braised (Pork Belly & Egg) in the Croak Pot. Hubby loved it. Thanks so much for sharing your recipes.